"This is my favorite tea, my dad used to make it for me all the time. It is a sweet and sour tea. You taste the honey and then the lemon! YUM,YUM,YUM! Great for soothing sore throats!" Pour water into a mug. Add honey and heat in the microwave for 1 minute and 30 seconds. Stir in lemon juice, mixing until honey is dissolved, then stir in the sugar. You're going to want to try this thirst-quenching, old-timey beverage. 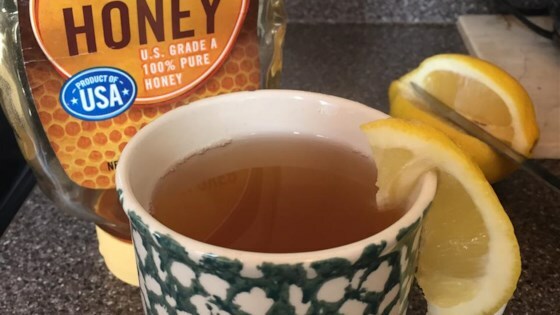 People here recommended me this recipe when my husband had a sore throat. I used 4t honey and skipped the sugar. Great result. Thanks. This works great to ease the pain of a sore throat and it tastes great too. My kids hate tea so this is the perfect alternative for them. I used a bit more honey.